I've had the chance to read and review a couple new books, Grace Unplugged by Melody Carlson, and Own It, by Michael & Hayley DiMarco. 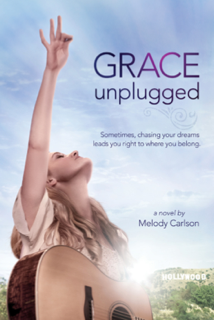 Grace Unplugged is coming out as a movie this weekend, and I thought it might be fun to have an idea as to the storyline before deciding whether to go see it. Grace Trey is an 18 year old singer as passionate about her Christian faith as she is her phenomenal, God-given musical talent. Both traits come from her father, one hit wonder Johnny Trey who found Jesus after losing his chart success two decades ago. When Grace encounters her own music break of a lifetime, the sudden dive into the "real world" puts her deeper beliefs to the test. Pop superstardom is just within reach but appears to require some spiritual compromise. Will Grace reject her faith, or will she own it? Grace Unplugged is based on the motion picture of the same name starring AJ Michalka (Super 8) and Kevin Pollak (A Few Good Men) with performances by award-winning artists Chris Tomlin and Jamie Grace. After reading the book, I found the description a bit misleading. Grace has grown up as the "perfect" Christian teen, with parents who are deeply committed to their faith. She's part of the worship band, attends Bible studies, and knows all the perfect answers. But Grace isn't really sure what she believes, so when she gets her "break of a lifetime" she sneaks off to Hollywood in search of stardom. I had a hard time identifying with Grace, honestly, which made the story a bit hard to read. But there certainly were points that made me think, and made me think a bit about where my kids are spiritually. Own It is referenced in Grace Unplugged, though the story has it written by one of the book's characters instead of by Michael & Hayley DiMarco. The movie Grace Unplugged tells the story of Grace Trey, an ideal Christian teenager who is also a phenomenal singer. But when she is pushed into the “real world” at the tender age of eighteen after getting the music break of a lifetime, her faith is put to the test. 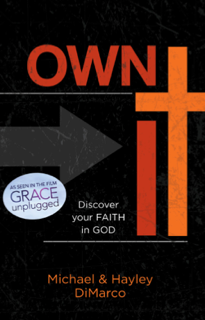 Own It mirrors the film by asking what it means to really “own” your personal faith rather than just automatically following in the footsteps of parents, friends, or other influencers. Best-selling authors Hayley and Michael DiMarco help readers understand what to do when faith meets real world challenges. Without solid beliefs, poor choices are likely to follow. You must take the time to really know who you are, who you are becoming, and who God made you to be. It's your personal faith . . . own it! I like a lot of the basic ideas in this book, and parts of it definitely resonated with me. I really liked the section on idols, and although I'm sure many would argue with their definition of idols ("An idol is something you have devoted your life to.") this really did get me pondering my priorities and my commitments. I get to give away a set of these books to one reader (in the US or Canada!). Both are pretty easy reads, which is always nice! It has some great life lessons. That it's something my young niece can read. I love faith inspired books and I think these would be great for my teenage sister to read! Flash Giveaway: Colorado Springs Area Only!